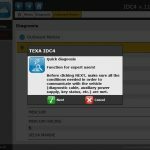 The V11 IDC4E MARINE has been developed to include technical data and additional functions, in one diagnostic solution. 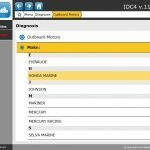 With the version 11 release, the IDC4E software introduces two new features: the QUICK DIAGNOSIS function and the innovative Nominal Values for guided diagnosis. The V11 MARINE now covers 38 makes and over 700 models. Below we will list some of the most important developments and updates included in this version and highlight the introduction of the makes CFMOTO, DAEDONG and FORD MARINE. New brand. The diagnosis of the injection of the engine “CF3100C/P” was included. New brand. 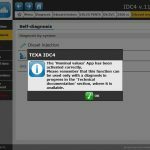 The diagnosis of the injection of the engine “D4DD” was included. New brand. The diagnosis of the injection of the engine “3.2 Duratorq” was included. The database was updated and the diagnostics were improved. The diagnosis of the injection of the engines “SE126E25”, “SE156E26”, “SE196E35”, “SE236E40”, “SE236S36”, “SE266E40”, “SE266S36”, “SE286E40” and “SE306J38” was included. 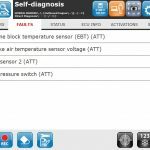 The diagnosis of these engines requires the new diagnostic cable AM32 (see chapter NEW DIAGNOSTIC CABLES). 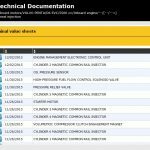 The diagnosis of the injection of the engines “MD704LH”, “MD704LI”, “MD704LS”, “MD706LB”, “MD706LH”, “MD706LI”, “MD706LS”, “MD706LX”, “MD706MS” and “MD706MX” was included. The diagnosis of the injection of the new engines “F115”, “F175”, “F200”, “VF115”, “VF150” and “VF175” was included. 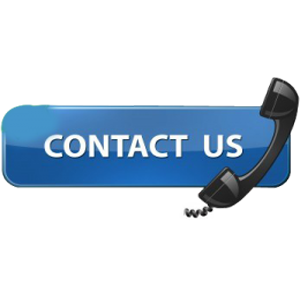 The database and the diagnostic coverage were updated up to 2015. Scroll thru the PDF file below for more information.